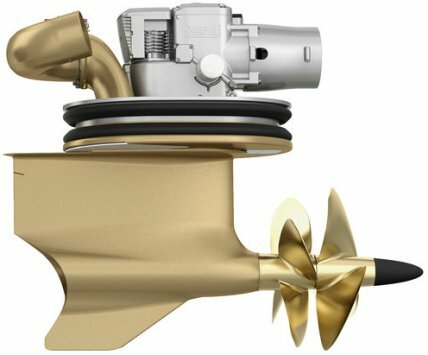 Volvo Penta has augmented its Inboard Performance System IPS pod design, to match the class-leading performance of its latest and most powerful diesel engine the new D13-1000. The remodeled IPS pod drive by Volvo Penta named IPS30 sees new and upgraded features to complement the company’s latest 13-liter 1000hp engine, to provide world-class performance. The redesigned pod is part of the company’s exciting breakthrough into a higher power category for its marine leisure segment, enabling yachts of up to 120ft to benefit from its excellent capabilities. The IPS30 pod has been updated to ensure it is a perfect match for the new design of the D13 engine. Overall, these enhancements make the pod cleaner, tougher, able to handle a wide speed range, while retaining the compact dimensions of existing IPS drives. The IPS30 pod and its co-ordination with the 13-liter engine sees the production of the D13-IPS1350 integrated package; the 1350 refers to the equivalent amount of horsepower produced from the unit, when compared to a traditional inboard shaft engine installation. The package is a complete system from helm to prop, with a technologically advanced design that has twin counter-rotating forward-facing propellers that sit below the hull for enhanced grip. The unique design, with individually steerable pods that are linked to the on-board Joystick Docking function, creates precision maneuverability. The IPS package provides up to 30 per cent lower fuel consumption compared to inboard shaft installations up to 15 per cent faster acceleration and 20 per cent higher top speed; noise and vibration levels are reduced by up to 50 per cent. An IPS package can be installed in twin, triple or quadruple configuration, and of the latter, the power produced is equivalent to 5400hp.